Schutzhund (German for protection dog) is a dog sport that was developed in Germany in the early 1900s as a breed suitability test for the German Shepherd Dog. The test would determine if the dog displayed the appropriate traits and characteristics of a proper working German Shepherd Dog. Today, it is used as a sport where many breeds other than German Shepherd Dogs can compete, but it is a demanding test for any dog and few are able to pass successfully. Since Schutzhund is a sporting event, then mental stability, endurance, strength, readiness for work, bravery and trainability of the dog are evaluated in this sport. 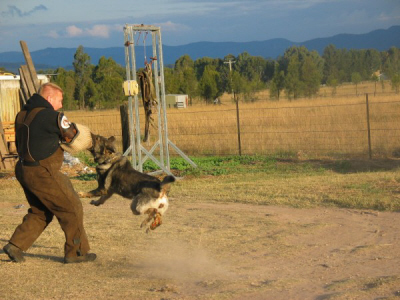 Schutzhund does not involve human protection though some of the skills employed in this sport are similar to those used for education of the dogs in police K9 and while training the dogs for protection and guard. Originally and basically Schutzhund is a sport. And this sport is targeted for evaluation and development such qualities in dogs which can make them more balanced, happy and useful companions for their owners. Those, who are familiar with the events of American Cynology Club on obedience and tracing work, should clearly understand the first two components of Schutzhund because they a have much in common with these testings. The standard of Schutzhund for the third part, protection service, is similar to analogical for police dogs. Though Schutzhund is not a test for police dogs or dogs-guardians, many dogs trained according to Schutzhund can be further retrained for these aims. Schutzhund is a sport, which the most different people are fond of: the young and the old, men and women, but also the disabled. Though it has German origin, nowadays hundreds of thousands people all around the world (at the moment form 17 countries) send their teams for world championships. The sport gives a participant the possibility to compare his or her preparation for the event with preparation of the other sportsmen and their dogs. It creates new affiliations and unions in the Cynology world. One of the attractive features of Schutzhund is that this event is held in the open air but at the same time it is physical and intellectual test. This is a good exercise, merry and full of positive impressions. 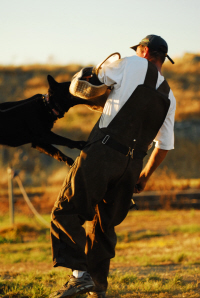 As any sport, Schutzhund requires a discipline of excellence. 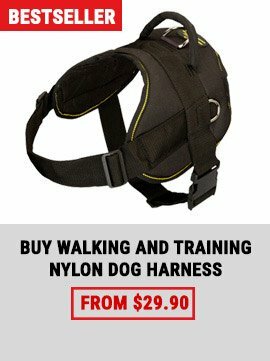 These are not eight-week training courses, when the objective can be achieved for short distance of time, which an owner with his dog leaves at the end of education. No, Schutzhund requires several years of work. 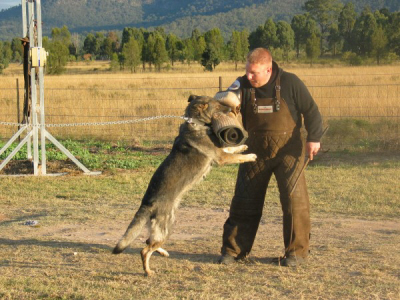 A true contestant at Schutzhund works with his dog and with the club to which they belong, from 2 up to 5 times a week. The middle age of the dog passing test on Schutzhund I equals to 2, 5 years old. 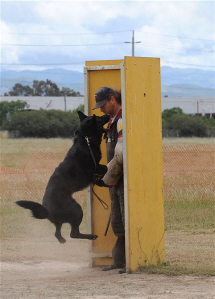 When major work is over, some of those who work seriously may continue to train in order to be able to pass Schutzhund III by the time when the dog reaches 3 years old. So much time it takes for all the three elements of stable development: education, imprinting and progress of the dog. If a person and his dog are going to compete very seriously then Schutzhund III just is the very beginning. At the age of 3 years the dog only gets “Black Belt” if referring to combat terminology. The top grade in the competitions the dog usually achieves just by 5-6 years old. Many years are needed for training and discipline of excellence in order to reach the top levels. It has respect to both the dog and the sportsman. They both represent a team that tries to build its perfect co-operative dance in unison. If this is done well and correct, then it is very pleasant to observe. Even today enforcement is one of efficient ways of dog training, but a one miserable coercion, unpleasant for the dog, may provoke a strong negative alteration in dog’s behavior. Enforcement has its big drawbacks. The correction made out of time and on the enforcement basis may cause undesirable behavior in the dog for a long time. If the dog feels tension, uncertainty, or on the basis of wrong correction it learned undesirable behavior, then it may last for months and years until the dog forgets or breaks this habit. If enforcement is unpleasant for the dog then it will arouse its desire to study at all. But if enforcement is applied properly that will enable the dog to learn willingly and in a good state of mind. Despite the enforcement during training may be very effective, there are the two reasons to be considered in order to argue you out of this. Before everything, the dog that wants to work is already a good dog. 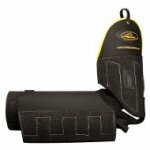 The second item: Protection sport should bring enjoyment not only to us but to a dog also. Naturally, that the methods of protection sport from the date of its origin have moved far ahead and consist not only in punishment for disobedience. New theory and practice have changed training methods very much, at the present time the methods of motivated and rewarding support are applied more and more. Full with motivation (without any enforcement) training has not gained its massive advancement as far. But already now considerable changes happen in this area: a free from enforcement motivated training increasingly acquires its spread. In tracing work it is food to be used as a motivating tool. During protection service training, the motivating method of training still has not gained proper appreciation and application due to many reasons. In protection service a dog endures correction much better because the dog is brought to an excited state. This excited state makes the dog less sensitive to stresses and pain, therefore all negative experiences acquired by the dog on the basis of enforcement are not too visible as they are in tracing work and discipline. At surface consideration it may seem that motivation will not be suitable in protection service. In discipline lessons we may not give the dog the things it likes very much such as dainties. In discipline, when a dog does not make mistakes we can reward or not reward it. When the dog’s behavior is undesirable we can restrain from encouraging it until it demonstrates proper behavior. That is to say the dog is unable to get a reward without our desire. In protection service everything goes on another scenario: the dog works for a bite, which matters a lot for the dog, even more than any of encouragements offered by us. The dog wants only one thing-to bite. During protection service the dog is often out of our reach. And even if we are near the dog, it is very difficult to miss being grasped (bitten) undesirably. A good dog stands difficulties and enforcement well and is controlled by enforcing properly. In length of time due to experience all these qualities become better and on. Skills of the dog improve and become fixed on the basis of positive experience and then it is difficult to break the dog of certain things. 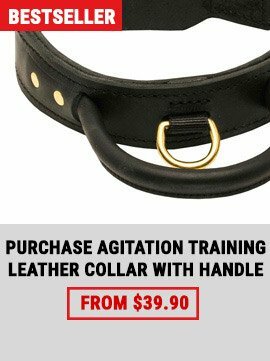 At barking in protection service, when a dog is very near from an assistant, it is necessary to find a way to interdict it from biting. 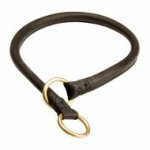 In this case one may use parforce, collar, lead and not to think what the operation of this on an aggressive dog. One has to recourse to such methods in order to inflict pain to the dog if it is disobedient. At that one should not reflect on the fact what effect this pain has on the excited dog and this pain with call enforcement of power correction. During biting the dog achieves its final phase of objective. Here we want to make the dog release “prey”, but we should admit that this will come in conflict with the skills we have taught it and with its usual behavior. Then we resort to the simplest thing what we know –to a lead, stick, etc. Otherwise how can we make the dog give us the thing that it possesses? 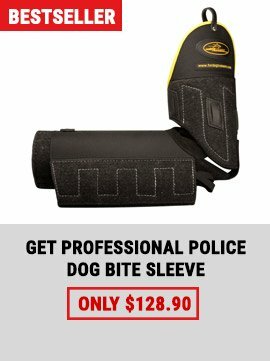 The problem in protection service is that we are unable to give the dog more efficient reward, than its bite for what it works in fact. This is the main reason of that a traditional training of protection service is based upon enforcement.